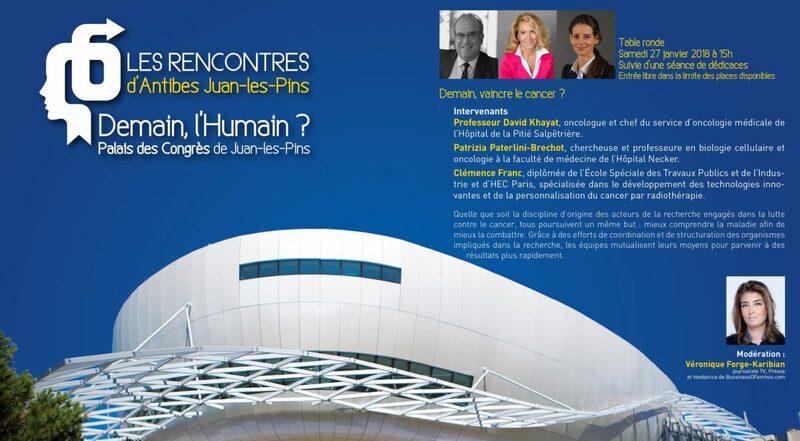 Prof. Patrizia Paterlini-Bréchot is among the speakers of the conference “Demain, le cancer?” together with Prof. David Khayat and Clémence Franc, moderated by the journalist Véronique Orge-Karibian , that will take place on Saturday, January 27, 2018 at 15:00 at the Palais de Congrès of Juan-les-Pins. A dedication session of Prof. Paterlini-Bréchot’s book, Tuer le cancer, will take place before the conference at 14:00. Admission is free within the limit of available places.